Thank you to Headline Review for sending me this book via Netgalley in exchange for an honest review. 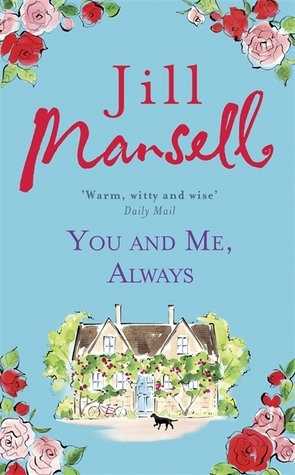 I've only ever read one other Jill Mansell book, and I must say I thoroughly enjoyed it and was looking forward to getting stuck into another. So when the opportunity came to read her latest book, I jumped at the chance. As you all know by now I love a good romantic chick lit read, so this was going to be right up my street. You and Me, Always is about twenty five year old Lily, who since the tragic death of her mother as a child has been brought up by her mother's best friend, Coral and her late husband Nick. Before her untimely death, Lily's mother wrote a series of letters for Lily to open on each of her birthdays, stopping at her twenty-fifth. Upon opening the very last letter, she finds out about her mother's first love Declan, and sets out to contact him. During the same time famous actor and screenwriter Eddie Tessler arrives in the village, fleeing fame and the paparazzi and soon strikes up a relationship with Lily, under the scrutiny of her childhood friend Dan. Before long secrets involving Lily and many of her friends start to emerge and things start to look as if they'll never be the same again. The main thing that stood out for me within this book were the characters. Although Lily was the heroine and main protagonist, it felt like all the characters I met had a main part to play. There wasn't a single character that I disliked throughout, and I loved reading about their back stories and finding out about their secrets, that I soon became engrossed and felt like I was a citizen of Stanton Langley. Each character had their own quirks and I found myself rooting for all of them to find happiness, especially Patsy. Despite this, I do have one gripe and that was that the storyline was very predictable. I'd read books featuring a similar storyline before, so I didn't feel as if it was anything to make a fuss about. I knew what was going to happen before I'd even read half of the story. I like to be kept guessing and be surprised when reading, and this didn't really happen for me. So it was slightly disappointing. However, the likeable characters certainly made up for this. You and Me, Always is a perfect book if you fancy something quick and easy to read, that doesn't leave you guessing or wanting to know more. I did enjoy it, and I look forward to reading more of Jill Mansell's work in the future.